I don't know what you're all going through today. You may be wrestling with issues in your marriages, parenting, work, volunteering, social circles or even church associations. Or you may be having a stellar day in the Lord and praising Him for relief from one thing or another. Regardless of where you're at this day, we know that in this world, our Savior and God, Jesus Christ, promised that we would have tribulation, but that we ought to take heart and be of good courage because He has overcome this world (John 16:33)...and indeed He has! 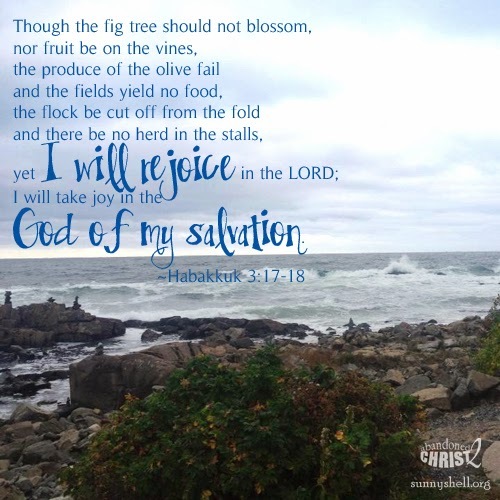 So, wherever your hearts are today far or near to the LORD, His Word, promises and comforts, I want to strengthen and encourage you with this passage from the book of Habakkuk. I love this short book from this prophet of old. I love the dialogue between him and our heavenly Father. And I love how patient God is with Habakkuk, his complaints and earnest prayers to understand what God is doing in a world that seems to be spiraling uncontrollably into a black hole; seemingly unnoticed by the Almighty. And as the LORD wisely and lovingly converses with Habakkuk, the prophet's last response is one that we all ought to strive for our hearts to pray.